On April 3, 2018, Cathy Owen, chairman of Eagle Bank & Trust, and chairman, president and CEO of State Holding Co. in Little Rock, was installed as the Chairman of the Arkansas Bankers Association. She is also the first female in the 128 year history of the organization to serve as its Chairman. 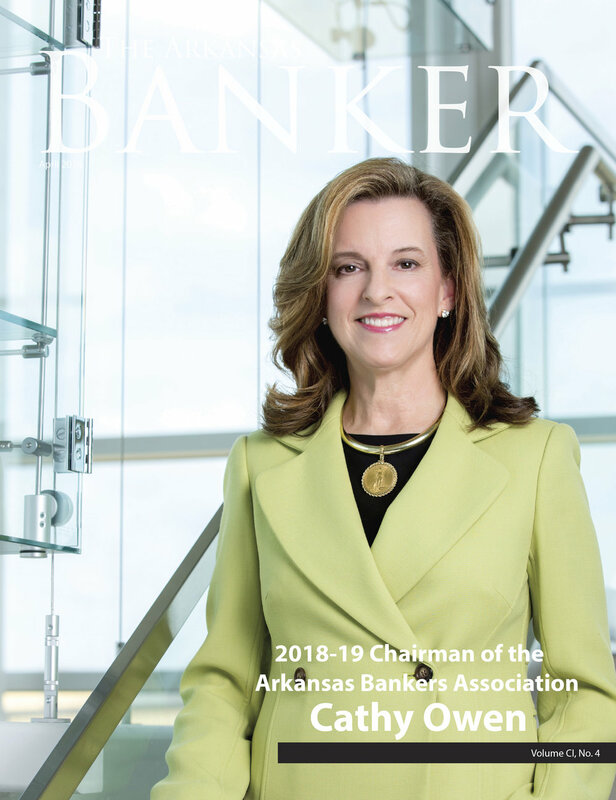 Cathy was featured on a recent cover of Arkansas Banker magazine with an accompanying profile. Cathy Owen, 2018-2019 Chariman of the Arkansas Bankers Association. I first met Cathy Owen a few years prior when I photographed her for a profile for Arkansas Business. Since then, Cathy has been receiving my quarterly e-mailers I send to all my clients. She contacted me back in January to discuss her ideas and desires for the photo shoot. Cathy wanted a clean, contemporary and modern setting for the photos. In addition to photos for the magazine, Cathy requested other photos for various professional needs and we updated her executive head shot. 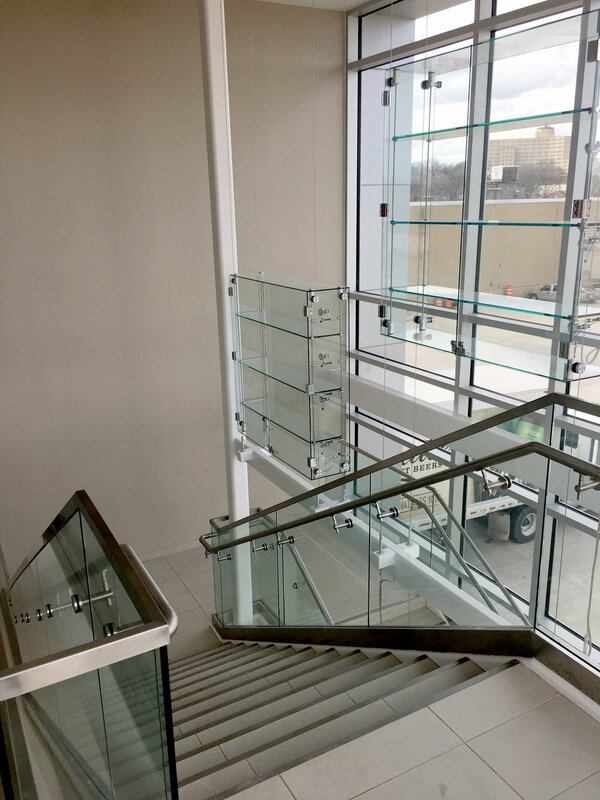 We chose a glass stairwell located at a privately owned business. The business also had an old banking vault door dating back to the late 1800s. It was a perfect location for the secondary artwork needing for the project. I scouted the location the week before with Cathy to determine angles, lighting placement and to discuss wardrobe. With the transparent glass that had a slight blue-green tint, Cathy brought numerous clothing choices in varying colors so we could determine which ones worked best against the glass. Cathy changed outfits four times throughout our half day photo shoot and each one complimented her and the location perfectly. We chose the vibrant red, Eagle Bank red, as the final outfit for the photo against the brass vault door. She is pictured with her husband Steve. “I was very impressed with the originality and quality of her professional photography on the 2017 photos she emailed. I couldn’t have been any more impressed with the professionalism and end results of the photography work of Karen and her husband.” -- Cathy Owen. The glass stairwell had a ton of natural light but I knew that was not going to be nearly enough. 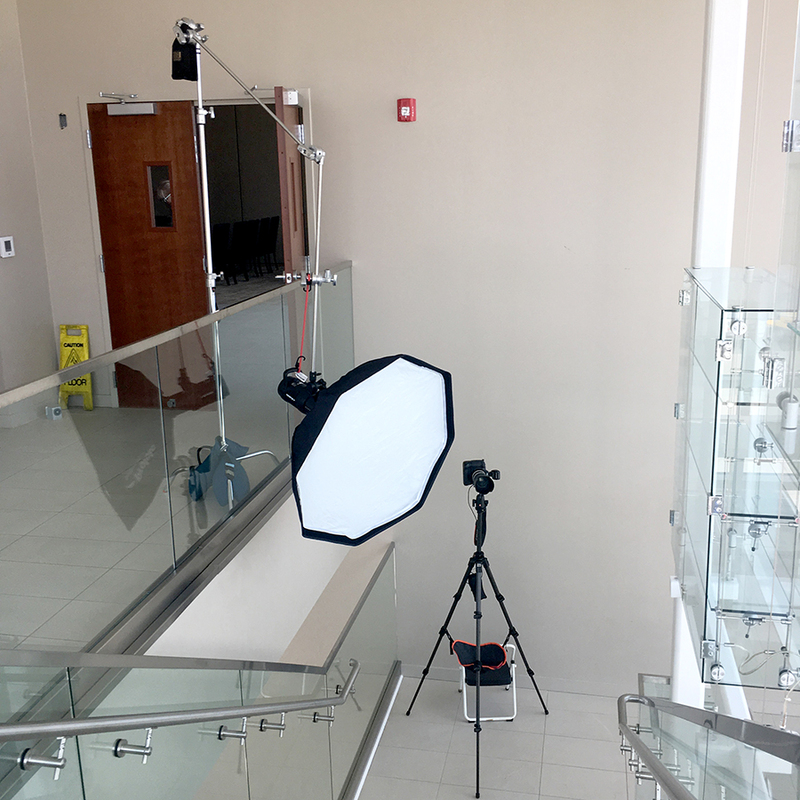 I kept the lighting clean and simple: For the stairwell portraits, I used one Profoto B1x with and my modifier was a three-foot Octabox with a simple white bounce. We needed a double arm on the C-stand to safely hang it over the top railing to give the lighting angle I needed. The headshot was the same setup with an added smaller softbox as a hair light. For the vault, we turned off all the overhead florescent lights (it was in an office) and the key was the same B1x combo plus another B2 bounced into the white reflector to light up the vault door. I also used the CamRanger system to proof photos directly to my iPad so Cathy could see her photos and make requests and any adjustments as the day progressed. Check out a few BTS below. Last week I met up with and photographed Hugh McDonald, president and CEO of Entergy Arkansas Inc., for Arkansas Business. Hugh McDonald, president and CEO of Entergy Arkansas Inc. According to the article, McDonald, said the company is in the middle of a planned $2.4 billion investment in capital improvements in generation, distribution and transmission projects, which began in 2014 and will run to 2017. Those infrastructure projects include deploying improved technologies. McDonald pointed to new generators that are 30 percent more efficient than the older technology as an example of such innovations. The utility is also deploying more renewable energy, including a proposed 81-megawatt solar energy plant in Arkansas County.